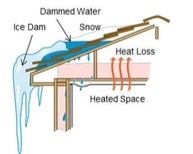 Ice Dam: A mass of ice formed at the transition from a warm to a cold roof surface, frequently formed by refreezing melted water at the overhang of a steep roof. The result is ice and water to back up under roofing materials. Imaging Radiometer: See Infrared Imaging Radiometer. to the vector addition of resistance, inductive reactance, and capacitive reactance in a circuit. Infrared Camera: See Infrared Thermal Imager. Infrared Imaging Radiometer: A thermal imager that is capable of providing temperature values for imaged objects. Infrared Inspection: The use of infrared imaging equipment to provide specific thermal information and related documentation about a structure, system, object or process. Infrared Reflector: A material with a reflectance as close as possible to 1.00.
patterns across a given surface. Infrared Thermographer: A person who is trained and qualified to use a thermal imager or an imaging radiometer. Infrared Thermography: (1) The use of a thermal imager or imaging radiometer to detect, display, and/or record thermal patterns across the surface of an object or animal. (2) The process of displaying variations of apparent temperatures (variation of temperature or emissivity or both) over the surface of an object by measuring variations in infrared radiance. Infrared Thermometer: See Non-Imaging Radiometer. Inspection Window: The time period during which infrared inspections of subject can be successfully conducted. This usually applies to roofs and building envelopes. Inspection Window for Roofs: The time period during which infrared inspections of insulated roofs can be successfully conducted. Insulated Roof: A roof whose insulation is between the deck and the membrane. The insulation is in direct contact with the underside of the membrane. Insulator: A material that opposes current flow. By definition, the element has more than one-half the required number of electrons in the outer orbit of its atom. At least 1 electron-volt of energy is required to cause an electron to leave the outer orbit of the atom and become a current carrier. Integrated Pest Management Professional: A person who is licensed and/or certified to perform pest inspections by the State(s) or region(s) in which they operate. Interpreting Veterinarian: A Doctor of Veterinary Medicine who interprets the thermal images of a horse. Inverted Roof Membrane Assembly (IRMATM): A patented, proprietary variation of the “protected membrane roof assembly” in which Styrofoam® brand insulation and ballast are placed over the roof membrane. IRMATM and Styrofoam® are registered trademarks of the Dow Chemical Company.